With Valmiki’s Ramayana as its guiding light, Shattered Dreams deftly entwines poetic beauty from the Kamba Ramayana and Ramacharitramanas, as well as folk philosophy from the Loka Pramana tales, to demonstrate how the ancient epic holds immediate relevance to modern life. In this book, we can experience the ancient saga of the Ramayana. We all have heard or rather read about the story of Ramayana since childhood and hence not commenting on the same. However, what makes this book different from others is the extreme detailing and the interpretation of acts which contributes to the development of our own perspective about the Ramayana. I am a huge fan of mythological books and epics. 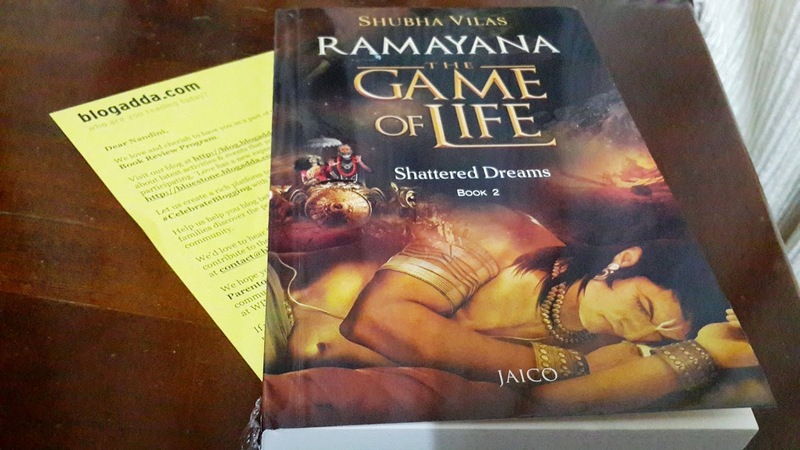 When I was selected to review the book Ramayana – The Game of Life : Shattered Dreams, I was overwhelmed when I received the book whose cover page was simply artistic. I finished reading this book in just 3 days. After reading this book now I feel like reading the first part of this book now. The main USP of this book according to me are the footnotes. The author has added footnotes on the take-aways and learning that can be imbibed from this epic. The another highlight of this book are the detailed stories. Many of us may not know how Dasaratha was called so, why a boatman wanted to wash Rama’s feet, why Bharatha refused to become the king etc. The book covers these minute aspects. In my opinion the qualities of Ravana have also been strikingly expressed in this book. Lastly hats off to the six Anarthas to conquere . I simply loved it. In few instances, the Rama and Laxman refers their step-mother by her name Keikayi which I felt is not appropriate. I will strongly recommend this book to everyone who loves epics.